Margaret Podlich has spent most of her life, both professionally and personally, dealing with water issues. A 1986 graduate of Tulane University in New Orleans, she started her career working with the Chesapeake Bay Foundation, quickly finding a niche creating many of the “green boating” concepts and materials now used nationwide. Podlich, 44, joined the Center for Marine Conservation (now the Ocean Conservancy) in 1990, and developed the original US Coast Guard SeaPartners environmental education materials. In 1994, she was recruited to develop the new nonprofit BoatU.S. Clean Water Trust, where she worked on many of the original “clean marina” programs, and wrote about environmentally compatible boating. When the trust and the nonprofit BoatU.S. Foundation for Boating Safety merged in 2000, Podlich added boating safety issues to her working agenda. 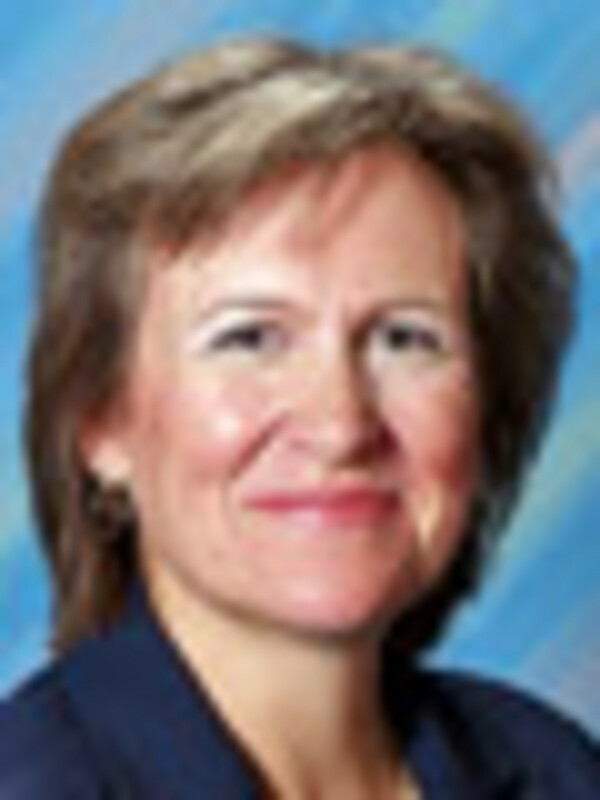 In 2004, she headed over to BoatU.S., where she is now vice president of government affairs, working nationwide on behalf of the association’s 650,000 boating members. She was a leader in securing passage of the Clean Boating Act, creating a permanent Clean Water Act exemption for recreational boats nationwide. An avid boater, Podlich has been on the water since she was three weeks old and racing since she was 8. She has raced inshore sailboats, including Lasers, Snipes, J22s and J24s at the national and international levels for more than 20 years. She has skippered in five Rolex Women’s Keelboat International Regattas, finishing fifth in 2001. 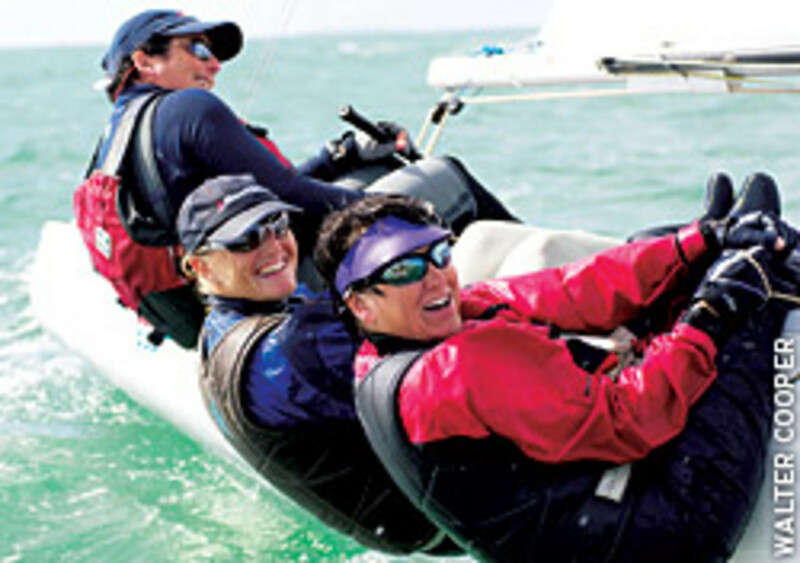 Yngling keelboat to secure a position on the 2008 U.S. Olympic team. This year, Podlich finished her first mini-triathlon, and is back racing Lasers and enjoying a new Zodiac center console RIB. Podlich lives in Annapolis, Md., with her husband, Steve, and her children, Sophie, 12, and Ben, 8. This interview took place Oct. 2, the day before the U.S. House passed the historic $700 billion bailout package and sent it to the president’s desk for his signature. Q. Do you anticipate any boating-related bills, for example the Coastal Zone Management Act, being passed before the end of this congressional session? Why or why not? A. I think, in general, Congress has its hands full, working on some real basic money/economy issues, and I don’t expect they’re going to move the Coastal Zone Management Act this year, or even necessarily in ’09. I think the Coastal Zone Management Act was last reauthorized in 1996, and I think it expired in 1999, so we’ve been running on these continuing resolutions ever since, kind of on an ad hoc basis. It doesn’t sound like it’s a real high priority for them. They’re so distracted, as they should be, with economic issues right now; I don’t think that one’s going to move at all until 2010. The BATSA (Business Activity Tax Simplification Act) bill, I think again, that’s really an NMMA bill; whether they’re going to do anything on that in the next couple of weeks, I doubt it. Q. Are there many outstanding issues left over from this session, and do you think they will be reintroduced in the next Congress? A. When I think of issues, it’s not always legislative issues, it’s more policy and what those of us connected to boating need. The biggest issue is the [economy]. The need is to help people feel good and strong enough to spend recreational dollars. BoatU.S. wants to make sure people can get out boating. Our 650,000 members need to feel comfortable about their economic situations — enough to continue to own that boat and buy parts and have a slip and maybe even upgrade the boat, or whether it’s a marina that needs to make sure their slips are full. It’s all based on consumer confidence and how people are feeling in terms of their own budgets. When you look at NMMA’s Recreational Boating Abstract, three out of four boat owners in 2007 had household incomes of $100,000 or less, and so when you think about our customers, they’re middle class and they’re worried about losing their nest eggs. They’re worried about losing their homes; they’re worried about whether their job’s going to be there. To me, the economic discussion is absolutely the foundation of what we do in boating for the next year or two. [Another issue] is Wallop-Breaux, which involves a tax that is already there on fuel and fishing tackle and import duty on boats. It comes into the federal government and it gets divided back out and it does things at the local level, like Clean Vessel Act grants, that fund pumpouts at marinas and boating infrastructure grants, transient docks and fishery stocks. That is up for reauthorization next year. So we are actively working with boating and fishing industry and user groups. Money is scarce in D.C., so it’s a concern that these funds [that come] from boaters and anglers go back to boaters and anglers. It’s going to take a significant amount of stewardship to keep it going to the right places. Our whole business is not based on a basic need of life. [Boating is] an option for most people. Because we’re all in a business segment that’s based on discretionary income, we really need to be concerned with how quickly and how effectively we can get this economic situation under control. What’s gong to happen to the AMT (alternative minimum tax)? The bills that have been discussed, the so-called bailout bills, they’re trying to put some tax relief for the middle class in there and address the AMT issue, and I don’t know how that’s all going to shake out, but certainly folks involved with boating need to look at that very carefully, because that’s a significant core of our business. Gas prices are just huge for boating. Our members tell us they’re changing their behavior. They may still own a boat, but instead of taking two guys out in two boats to go fishing, they all join up and pool gas money and one boat leaves the docks. Our members are increasingly shopping gas prices. We’ve got a cooperating marina program where more than 300 marinas around the country give our members a discount, and people are telling us they are starting to plan trips around that. The good news is that, for so many people, boating is part of our life, part of our very being. It is something that will kind of ebb and flow with the economic times: Maybe we downsize, maybe we just don’t leave the dock as much, maybe we go sailing a little bit more and not use the powerboat as much. But it’s still an amazing place to find solace, and I know for me, amid all the stresses of life and the juggle of kids and parenthood and home and work, it’s a wonderful escape, and that’s not going away. To the extent that we can sell that, to the extent that we can help people remember how fabulous that experience is, the more we will benefit. I think those are some of the core issues facing boating. Some of those translate to legislation, some don’t. I think the biggest legislative concern is the whole economic boost at this point. Q. Passage of the Clean Boating Act was a huge success for the industry. Talk about why it was such an accomplishment to get that bill introduced and passed in the time frame in which it happened. I think the No. 1 success of the Clean Boating Act is that, for what may be the very first time, I saw all different elements of boating get together toward a common goal. It didn’t matter if you were a marina, if you were an engine manufacturer, a boat manufacturer, you sold used boats, you were a cruiser, you were an angler; everybody pulled together. Sometimes the industry and [its] consumers don’t agree, and sometimes they fight each other. I think the No. 1 success of the Clean Boating Act, getting the legislation through, is that we showed how effective a coordinated grassroots effort could be. I think we even surprised ourselves on that. In terms of getting the legislation introduced and then getting it through, here I sit in early October and look at what Congress is doing, or not doing, and I think, “Thank God we didn’t have to wait until September to get this bill passed because it wouldn’t have happened.” I think there’s a lot of good fortune in there and a heck of a lot of work by the National Marine Manufacturers Association, in particular, and tons of other groups, and BoatU.S. We had a lot of twists and turns in the timing. The first piece of legislation was introduced in May of 2007 and we finally got that bill signed by the president on July 29 of the following year — so it really was 14 months of active legislation, and that doesn’t even count the background of trying to get the first piece of legislation written, and a whole lot of politics. Do we have too many Republicans on the bill? Do we have too many Democrats on the bill? And trying to convince lawmakers that, whether Democrat or Republican, you’ve got boating in your home district and this is why this bill makes so much sense. Q. As far as boating and the boating industry are concerned, is there one political party that tends to favor its issues? We had friends on both sides; the love of boating does not have a party affiliation. I don’t really think it’s so much about what party is in power, I think it’s about how everybody works together, or doesn’t. Q. In terms of the two presidential candidates, Democrat Barack Obama and Republican John McCain, have you heard anything that should concern boaters or you think will be particularly favorable to boaters and the boating industry? A. I wish I could know every step they’ve taken all of their lives and figure out how many times they’ve been on a boat, but I can’t do that. I think that, if you step back, we’ve got an interesting situation shaping up, no matter who gets into the White House and it starts with Congress. We’ve got a slight Democratic majority in the House and the Senate now — very slight in the Senate; a little bit bigger in the House — but we’ve got Democrats in power. Right now, all the pundits are saying they expect the Senate to gain an additional six to eight Democratic seats, so they’re predicting a stronger Democratic Senate. In the House, which has about 33 more Democratic seats than Republican right now, they’re expecting an additional 12-17 seats, so they’re potentially looking at the House having almost 50 Democratic seats over Republican. That’s huge. So, take that and take it with a grain of salt because none of us has a magic ball, and take that premise and apply it to whether we get Obama or McCain. If you get Obama — and history says after you’ve had one particular party in the White House for eight years you usually switch parties — well there may be a little bit of a logjam of Democratic wish lists. For a while now, Democrats haven’t necessarily been able to get through the White House what they wanted to get done. The problem is that Obama’s not going to have any more money than McCain does, and right now nobody’s going to have any money. So the expectation that these pent-up wish lists will actually be addressed may not happen. He may actually have to be a bad guy and say no. If a Republican gets in, you kind of already predict those struggles in the normal checks and balances in which a Democratic Congress brings things to the Republican White House and the White House routinely turns them down. It’s intriguing to me we may expect more of those wish lists to be taken care of if there’s a Democrat in the White House, but looking at the budget I don’t know if that’s realistic. It keeps coming back to we’ve got to get the country on a better financial footing, because that’s the foundation for everything we do. Q. How important and/or influential is the Congressional Boating Caucus? A. I think NMMA has done a great job of organizing that [NMMA created it in the late ’80s]. It’s very important to have a caucus because that’s kind of like your holiday card list; it’s your list of super contacts, your list of favorites. When you need a boating champion, that’s your go-to list. If you look at the Clean Boating Act this year, the sponsors and really the champions of that legislation came from the boating caucus. Right now the caucus has 22 Senate members and 144 House members, and so clearly after the election, it’s going to need to be revitalized and recomposed. Q. How important is it for that caucus to have a good balance of Democrats and Republicans? A. I think it’s really important to have it balanced. As we’ve seen recently, you’ve got to have a piece of bipartisan legislation for it to move. You’ve got to court both sides. After the election, I think it’s still going to be important. It may change a little bit if the Congress goes a little bit more Democratic. Q. In terms of lobbying, how large is the boating industry’s presence on Capitol Hill? A. It depends on how you define boating industry and lobbyist. I’ll use the Clean Boating Act as an example. There are the formal lobbyists, people whose job it is to go to the Hill and know people and talk, and in terms of that, clearly the NMMA is leading that charge. They have several lobbyists on staff and they also contract. Then there are other groups like BoatU.S. and all kinds of other groups that have a couple of lobbyists. We’re not on the Hill every day, but we’re there when we need to be. With BoatU.S., I would apply the term lobbyist much more informally to our 650,000 members, who are amazingly active when you stir the pot. On the Clean Boating Act, in particular, they have been so responsive, so on top of it. It was going to touch every one of my members. It’s the informal side of lobbying or constituent-based activism, and that’s really where BoatU.S. kicked in. The ability of our members to reach out and touch their representatives, that’s very, very powerful. It’s a more informal version of lobbying. For example, there was one Wednesday we heard something was going to happen in a Senate committee on Thursday, so we came back and Wednesday night sent an e-mail to those committee members’ constituents. We said, “Sorry, it’s late; we know this is late, we just heard this, we just got back from D.C., and we need these guys to hear from you.” We sent it out after 5 p.m. and the committee meeting was at 10 or 11 the next morning. That overnight e-mail helped generate so many calls to those offices that their voice mails were full the next morning. “I understand there’s this committee meeting tomorrow, and I really appreciate you considering this perspective as you go into this committee meeting.” That, to me, is an amazingly powerful blend of on-the-ground lobbying by a number of different groups and then this huge grassroots constituent lobbying all over the country. Q. Do you see that type of partnership happening again, with all sides of the boating community joining together? A. I’d love to do it again. I think it really depends on the issue. There are a lot of issues where we need to work together to survive. A couple of years ago, when I started this job, we were faced in Florida with real strife from the marina community, because they’d been through a couple of years of hurricanes and they needed to be able to better protect their property against boats that were not prepared for the storm. We started talking about what our needs were, and we realized pretty quickly that, as the storm left, the marinas needed to be operational and the boaters needed boats that were still in one piece in the right place. We had a common goal, and we started thinking about how can we get there. Where do I feel comfortable with the marina retying up my boat if I live in Kansas and my boat’s in Florida and a hurricane’s coming and I can’t get down and retie that boat? What powers do I feel comfortable giving the marina? What charges do I feel comfortable with them assessing me? And how can we work together so the marina has the legal ability to retie up my boat or move it to a different corner of the marina or even haul it? How can we help them, so in the end we still have boats and the marina’s still a viable business? As a result, we passed legislation in Florida that made that happen. That, to me, is a core philosophy in all these topics. There are lots of issues facing boating that we all can work on together. There are going to be a few that we can’t, but we all talk to each other; we’re all working with each other to the extent that we are able, and we realize that together we can do a lot more for boating than we can separately. I look forward to working more with NMMA and the other partners like we did on Clean Boating Act.